We flew from Da Nang Airport to Ho Chi Minh City. At the airport there were no green and white taxis waiting, so we (stupidly?) climbed into a supposedly reputable alternative (‘Vinasun’) who took us on a massive detour, eventually instructing us to get out at a random bus stop; thankfully, we refused to comply and finally we were dropped at the bus station. Bus tickets to Can Tho were purchased, and a chubby little Vietnamese boy kept us all well entertained until our bus (mini-van) arrived. Little did we know, this trip was about to make every other journey we’d endured seem first class. We squeezed into the back row of a minivan, where we could not physically fit shoulder to shoulder. There was no air-conditioning, rather a mere ‘air-flow’, and the temperature was so hot outside it was virtually unbearable to have the windows open. On the trip we befriended two Americans (Sarah and Katie) and and a Frenchie (Julian). After an abrupt stop in the middle of nowhere (a few kilometres out of Can Tho), we were forced onto the side of the road with the van driver quickly racing off into the distance. We had barely comprehended what had happened when Summer realised in the sudden rush she had left her handbag on the van (containing her wallet, passport, eyeglasses and passport). 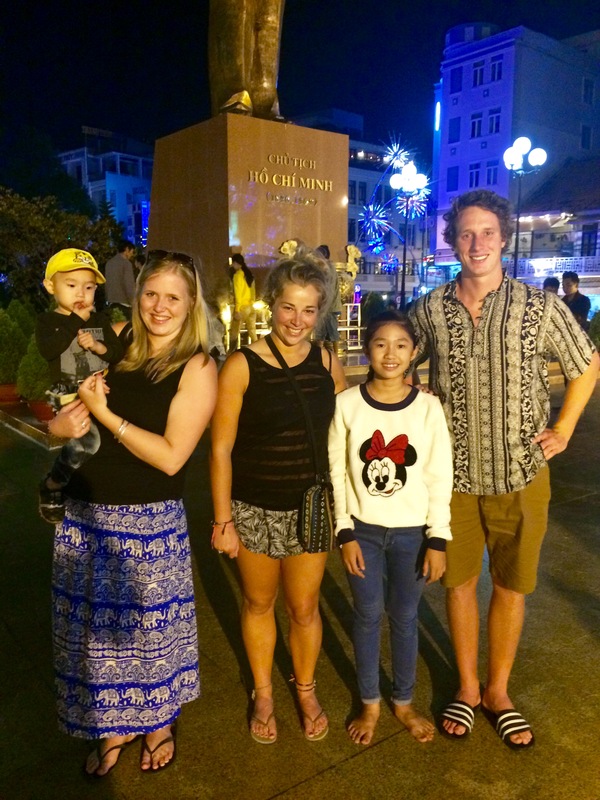 Thankfully, I had experienced losing a passport before so we managed to keep a lid on what could have been a very stressful situation (we had plans to cross through to Cambodia in the next few days). Fortunately one of the men at the hotel spoke relatively good English, so he was able to help us by phoning the bus company (somewhat bizarrely, James had been given, and for some reason kept, the company’s business card). It was a very confusing situation; we finally pieced together that the bag had been located, although the wallet was now missing, and there was only a small possibility the passport would be returned. 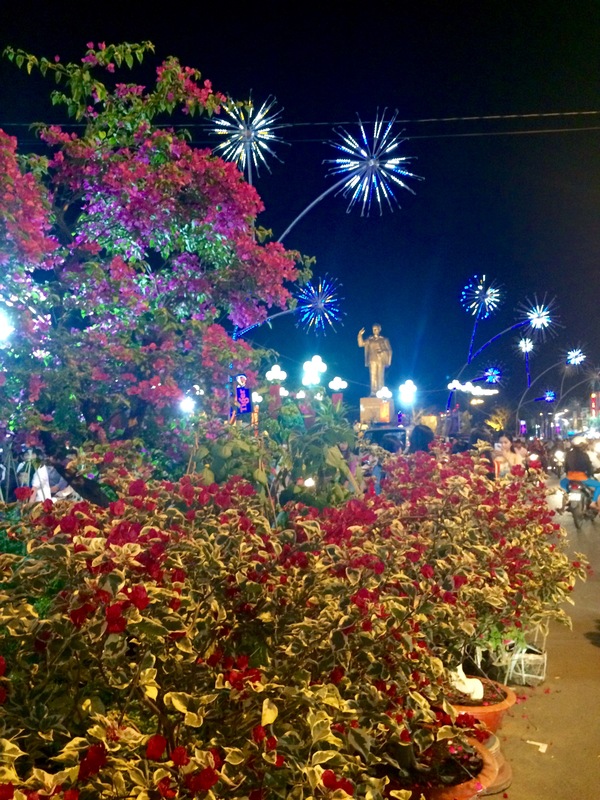 We tried to keep Summer distracted; practically forcing her out of the hotel for dinner and to explore the flower markets and the square of the Ho Chi Minh statue. We thought we were people-watching (there was so many adorable, hyper-active Vietnamese children); it turns out the people were watching us – we were inundated with requests for photos. We convinced Summer that going to the floating market early the following morning was totally worth it; at least that way, if we had to go back to Ho Chi Minh the following day (to visit the NZ Embassy) at least our trip to the Mekong wouldn’t have been a complete waste of time. Back at the hotel, we all struggled to sleep and the emotions we felt when we heard a knock on the door accompanied by ‘passport is here’ were beyond ecstatic. Summer and I raced downstairs to find a lady on a motorbike with her baby, holding Summer’s bag. We had been advised to tip generously (despite Summer’s wallet being taken) but it was a small price to pay in the scheme of things. Our alarms went off before 5am, and we made our way down to the foyer to meet the others before heading down to the riverside. Julian successfully bartered us a deal – we climbed aboard a boat and set off down the river for about 40 minutes in the dark before we witnessed a beautiful sunrise. 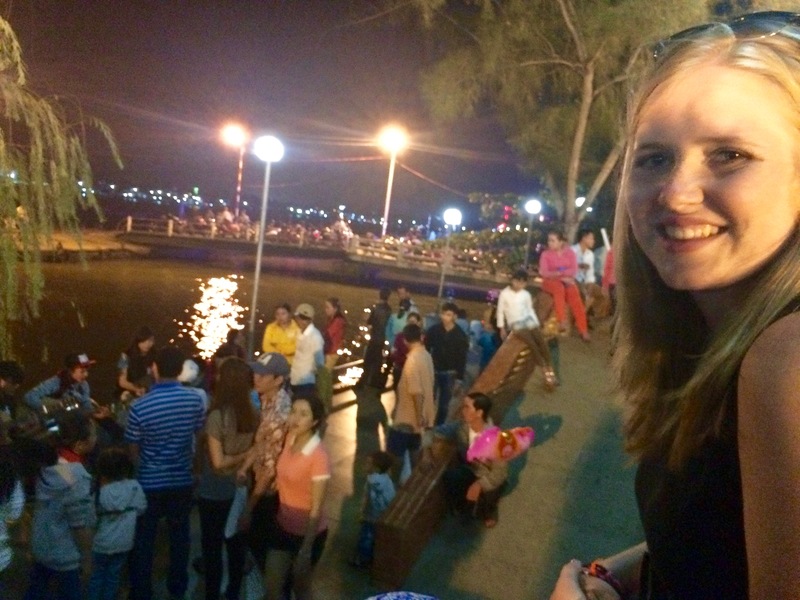 Eventually we arrived at the Cai Rang market; the biggest floating market in the Mekong Delta. After floating through the market, our driver made us get out at some rice-paper making farm/cafe for an hour – needless to stay none of were impressed by this potential scam. Julian argued convincingly on our behalf, and so we got back in the boat and headed back to the market. There were massive boats anchored, with flags waving high in the high advertising what commodities they each had for sale. Smaller boats were maneuvering their way through the larger boats, bartering and trading various goods. For breakfast, the group stopped at a floating restaurant – although Summer and I refrained from eating until we got back to the hotel. We booked our tickets to Rach Gia – to our delight we were put on an actual bus, where we had at least one seat per person. Upon our arrival at the bus station we were ushered off into a minivan, and although no-one had any idea what was going on, we went along with it. Poor James was squished into the back seat, and Summer and I had the ‘luxury’ of sitting in the front – our driver honked at literally anything and everything, and kept yelling in frantic Vietnamese to the people sitting behind by us. We finally worked out that the driver was dropping us at the station so we could transfer buses to get to Ha Tien (unbeknownst to us why there wasn’t just a mutual station). This last bus was about as local as you could get – Summer and I could barely fit our knees behind the seats, so I have no idea how James coped behind us – especially once a Vietnamese lady came and sat next to him. There was people cramped on stools in the aisles, and the bus made about a million stops. Eventually we arrived and opted to walk into town as opposed to catching a taxi – we’d had enough of bartering for the time being.